The Maghreb (المغرب العربي al-Maġrib al-ʿArabī; also rendered Maghrib, or sometimes—though rarely—Moghreb) is a collection of countries within what is commonly termed Northern Africa. The area lies along the Mediterranean Sea and the Atlantic Ocean. 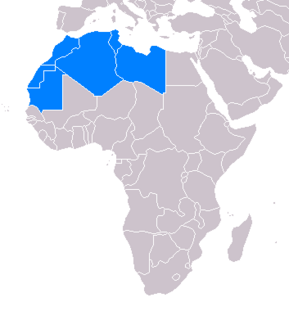 The modern definition of the Maghreb includes the nations of: Mauritania, Morocco, Algeria, Tunisia, and Libya, although former definitions of the region were not limited to these five countries. The earliest definitions of the Maghreb were geographically quite broad, as the word Maghreb simply means “place where the sun sets” (or western), in the Arabic language. The people of the Maghreb belong to both Berber and Arab ethnolinguistic groups. The region as a single political entity was united only during the first years of Arab rule (early eighth century), and again under the Almohads (1159–1229). The Arab Maghreb Union was established in 1989 to promote cooperation and integration among the Arab states of North Africa. Envisioned initially by Muammar al-Qaddafi as an Arab superstate, the organization is expected eventually to function as a North African common market, although economic and political unrest, especially in Algeria, have hindered progress on the union’s joint goals. The Maghreb is primarily defined through a series of physical geographic features that separate the area from the rest of Africa. The first feature to shape the Maghreb is the Atlas Mountain Range, which define the region's northern border. The Atlas Mountains provide a series of plateaus that receive an annual rainfall of over 100mm a year. Not all the regions of the Maghreb are lucky enough to receive the same steady rainfall as the Atlas Mountains, as the southern portions of the Maghreb fall within the dry lands of the Sahara Desert. While the size of the desert zone varies among the countries within the Maghreb, with it consuming about half of Tunisia but over 80 percent of Algeria, the desert environment impacted growth and development in the Maghreb. In particular, the broad expanse of the Sahara to the South and the treacherous Atlas Mountains to the North led the Maghreb to develop a closely knit culture based on physical proximity. The geographic isolation of the Maghreb also led to formation of an independent trade system that tied together the population along economic lines. The earliest recorded history of the Maghreb deals with its position as a powerful trading location for the Mediterranean region. In their quest to control the Mediterranean, Phoenicians were the first to occupy many ports along the Maghreb coast. 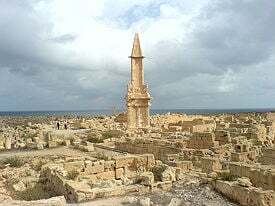 Particularly notable among the Phoenicians were a group called the Carthaginians, who founded the great city of Carthage. With the defeat of Carthage in 146 B.C.E., many of the valuable ports of the Maghreb passed to Rome. Ultimately, the Roman Empire took control of almost the entire Maghreb north of the Atlas Mountains, sparing only some of the most mountainous regions such as the Moroccan Rif. One of the early contacts between the Maghreb and the outside world occurred in the seventh century C.E., when Arab invaders from the east conquered much of North Africa. While the invasion was originally due to religious motivations, by the tenth century it had taken on a political dimension. Under the new regime Arab leaders replaced traditional leaders. One of the most notable dynasties to arise from the foreign rule was the Fatimite dynasty in Egypt. Later dynasties initiated by the Arabs included the Almoravid dynasty and the Almohades. Arab supremacy in the Maghreb began to decline in the early 16th century, when the Turks succeeded in gaining control of Egypt in 1517. While Egypt is not typically considered to belong to the Maghreb region, the Turkish occupation of the territory provided a base for westward expansion into North Africa. Once in control of the region, the Turks designated many political regencies whose names resonate in modern Africa, including: Algeria, Tunisia, and Tripoli. Turkish forces were not strong enough, however, to subdue Morocco, which remained an independent state outside of Turkish control. The succession of invaders into North Africa introduced a wide variety of wildlife to the region, most notably the camel. The camel, with its unique ability to withstand the harsh conditions of the Sahara, opened up the opportunity for trans-Saharan trade and intercontinental communication. By the sixteenth century C.E. Arab traders from the Maghreb had solidified their place in the economic system of North Africa. Many of these traders grew rich by trading through Timbuktu, a bustling market–town that linked the traders from the North to coastal and southern traders. The European continent was also eager to join in the trade on the African continent, and used the coastal territories of the Maghreb as a basis for operations. Many Italian cities developed strong trade contacts with North African territories, particularly Venice, Pisa, and Genoa. Portugal was also successful in gaining control of territory in the Maghreb, using the citadel of Ceuta as base for voyages into Morocco. The European presence along the Mediterranean edge of Africa went into decline in the sixteenth century C.E., with many European powers unable to continue their overseas presence. Also contributing to the decline of a North African European presence during this time, slave exportation from West Africa increased dramatically. The potential for wealth from the slave trade caused many European trading companies to shift to the southern portion of Atlantic West Africa, where heavy slave trading took place. In the last quarter of the nineteenth century C.E., European powers began a Scramble for Africa, where they attempted to secure a place on the global political stage by using satellite colonies for raw materials and economic gain. In the Maghreb, France became the dominant colonial power, taking control of Algeria, parts of Senegal, and a significant port at the entrance to the Red Sea. France also gained control of much of West Africa, a fact still apparent today in the common languages of the region. France, in its bid for North African dominance was unable to dominate Tripoli, which was instead conquered by the Turks. In the middle of the twentieth century C.E. a wave of nationalism swept across the African continent that urged European colonial powers to abandon their African possessions. Some in the Maghreb were not so eager to abandon their position as a colony, as the French government often granted preference to their colonies in trade. Despite potential economic consequences of decolonization, the movement gained strength, culminating in independence during the late 1950s and 1960s. The region is still plagued with many problems that can be seen as the result of colonization, particularly regional conflict. The conflicts have led to increasing militarization in the Maghreb and substantial standing armies in many countries. 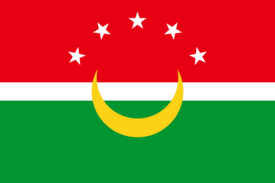 Flag of the Arab Maghreb Union. The idea for an economic union of the Maghreb began with the independence of Tunisia and Morocco in 1956. However, it took over 30 years before the concept took hold. The Arab Maghreb Union was created in February 1989 with the intention of creating economic and political unity between the Maghrebi states. The organization is fashioned in the image of the European Union, as a body through which members could negotiate trade relationships with other entities as well as improve relations among member states. The intended goal is an eventual free-trade zone among member states, a unified customs regime for extra-union trade, and a common market where people, products, and capital circulate freely. The organization is governed by a council made up of the heads of state of the five member states, which meets biannually. The chairmanship rotates annually. Various committees within the organization include interior, finance, energy, tourism, and postal ministries. A judicial body made up of two magistrates from each member country serves to mediate issues between member states and advise AMU councils on matters of law. Morocco's claims to the Western Sahara in opposition to Algeria's support of its sovereignty have caused strained relations between the two nations. The organization itself stood against Libya's role in the bombing of an airliner over Lockerbie, Scotland, in 1988. The opposing political positions have served to cripple the AMU. These situations have led the group to establish a number of joint bodies to address common concerns, including the International Organization for Migration, the Maghrebi Bank for Investment and External Trade, the Working Group on Fisheries, and the Maghrebi desertification observatory. 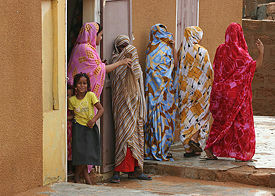 Women in Mauritania Bedouin village, 2006. 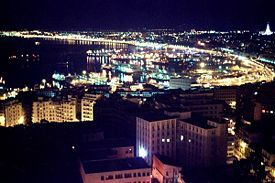 Night view from Tunis, Tunisia. 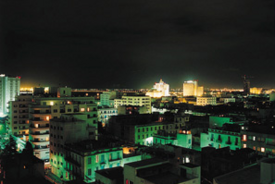 Traditionally, the Maghreb has been linked to the Middle East through linguistic and cultural ties. Even today, a majority of the population of the Maghreb identifies as Arab, despite the fact that the Berber people were actually the first population group to inhabit the region. The remaining Berbers in the area, while a minority to the Arab identifying population, represent a sizable portion of the population in Morocco and Algeria. Ethnic groups boasting smaller populations than those of the Arabs and the Berbers also exist in the Maghreb, notably enclaves of Europeans settlers who fled the to Africa seeking fortune or asylum from persecution, and a substantial Turkish population in Tunisia and Algeria. The Maghreb region first experienced religious unity under the rule of the Roman Empire in the Pax Romana from 27 B.C.E. to 180 C.E. With the Roman Empire dominating the region, a period of political stability was ushered in that allowed individuals to practice religion without being threatened. Eventually, the Maghreb became a cultural and religious center where the new ideas of Christianity were discussed. By the second century the ideas of Christianity had taken root in the Maghreb and the area boasted a a rich Christian culture, including among its population the writer Tertullian (c 155 - c 202), many Christian Church martyrs, leading figures such as St. Cyprian of Carthage, Righteous Monica and her son the philosopher Augustine, Bishop of Hippo I, and St. Julia of Carthage (fifth century). The first challenge to religious homogamy in the region came in 429 C.E. when the Vandals led a series of attacks along the African Mediterranean coast. Under the leadership of King Gaeseric the Vandals waged a highly successful campaign, which culminated in the Vandals achieving control over much of the Maghreb by 442 C.E. The Catholic Church played a major role in opposing the Vandal rule, a position which turned the military invasion into a conflict of religious ideologies, with Catholicism pitted the Aryan beliefs of the Vandals. The Catholics succeeded in removing the Vandals from power by 533 C.E. In 647 C.E., the Maghreb again faced religious turmoil, when an Arab invasion forcibly introduced Islam to the region. While Islam quickly gained converts, Christianity continued to be actively and widely practiced in the area. In fact, the Christian population was large enough in the ninth century to cause Pope Benedict VII (974-983) to consecrate a new Archbishop of Carthage. Beginning with the tenth century, however, records of actively practiced Christianity are very sparse. Islam had succeeded Christianity as the religion of the majority. While Islam has remained the predominant religion since the first Arab invasion in 647 C.E., small communities of minority religions have managed to coexist peacefully in the Maghreb. A notable minority population is the Jewish community, many of whose members fled to the Maghreb in the tenth century from Baghdad, where social and political conditions had rendered it unsafe for them to practice their faith. From this origin exodus to Maghreb, a unique Jewish identity called the Maghribis emerged, where Jewish men involved in trade passed this identification on to their sons. ↑ The Columbia Encyclopedia, Sixth Edition. Maghreb, Retrieved August 23, 2007. ↑ Mideast & N. Africa Encyclopedia. Arab Maghreb Union, Answers.com. Retrieved August 23, 2007. ↑ Avner Greif, Contract Enforceability and Economic Institutions in Early Trade: The Maghribi Traders' Coalition, American Economic Review. Retrieved August 23, 2007. Fostering Understanding and Development of the Maghreb. The Maghreb Center. Retrieved August 19, 2007.